When it comes to cake- I like mine in the dark chocolate version, covered in more chocolate. 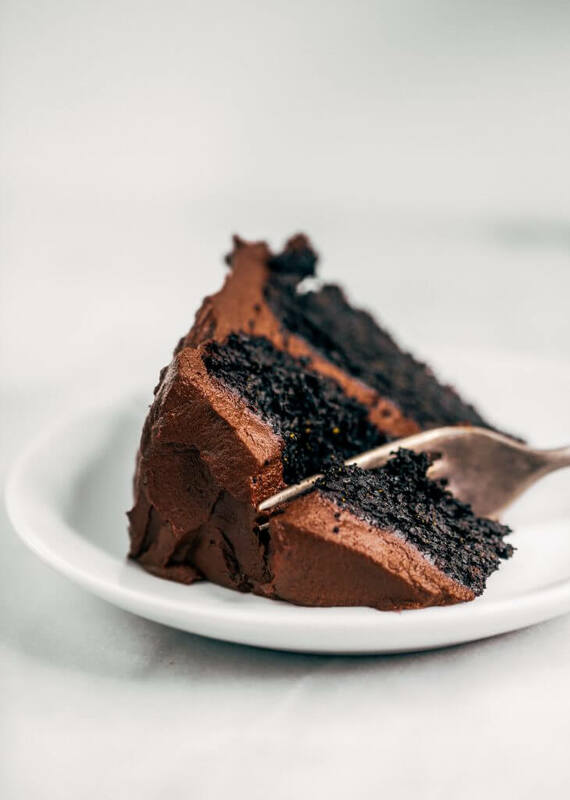 Nothing beats a slice of chocolate cake; especially, when it’s packed with veggies! 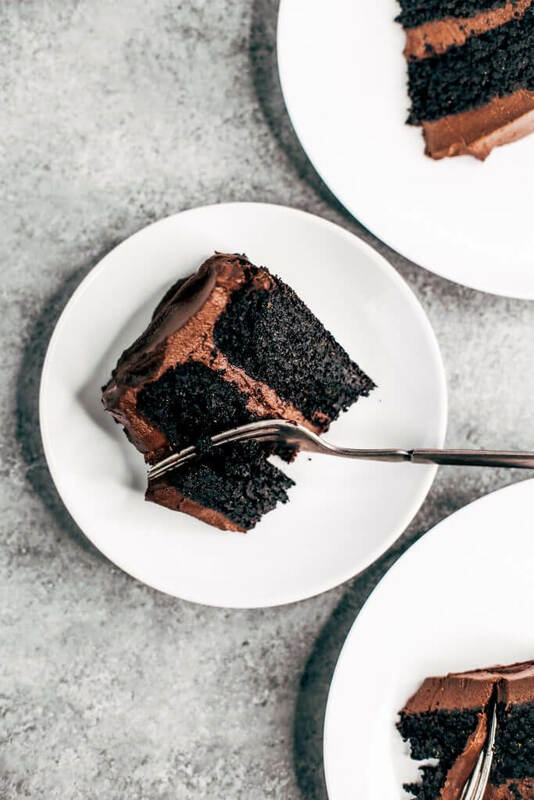 This chocolate layer cake is probably the healthiest cake you’ll-ever-have-in-your-life. The base is made with raw sweet potato instead of flour and the frosting is oil-free and sugar-free; instead, I used sweet potatoes, avocado, and dates! If you’ve ever seen the 1960’s Pollyanna film, then you know that those gigantic chocolate and vanilla cakes made for the bizarre were pretty much the most satisfying thing to watch being sliced and served. It slices like a cloud from heaven. 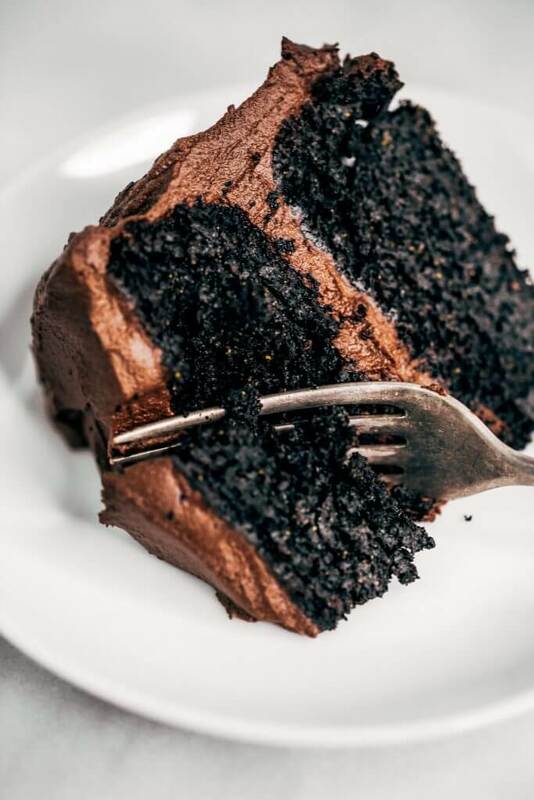 Btw, is there anything better than cutting into chocolate cake? 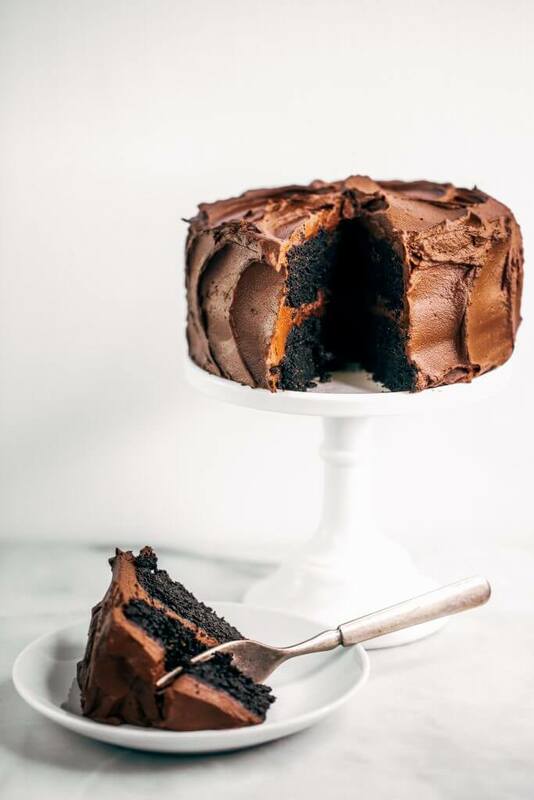 Avocado sweet potato chocolate cake! I’ve made this chocolate cake before, but since you all requested a video for this recipe, I figured I would go all out! 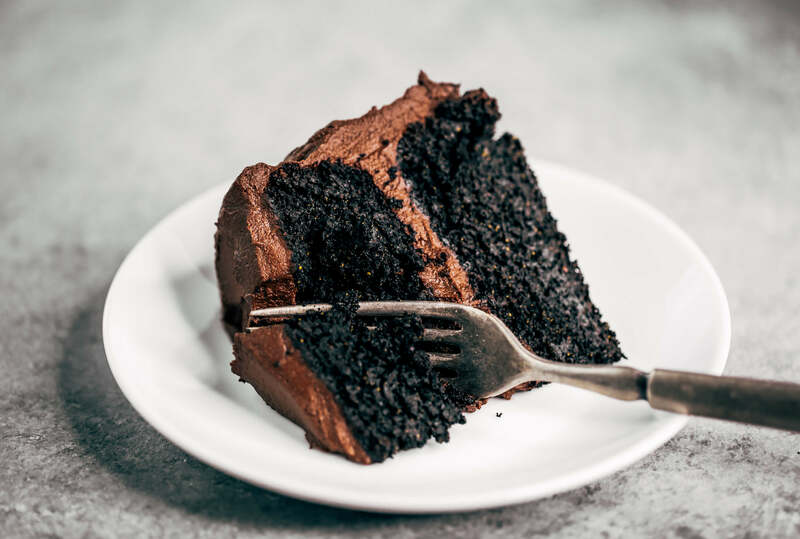 I tweaked the frosting recipe by the slightest and changed the overall concept and recipe a bit, but it’s still the same ol’ good paleo chocolate cake I made originally. 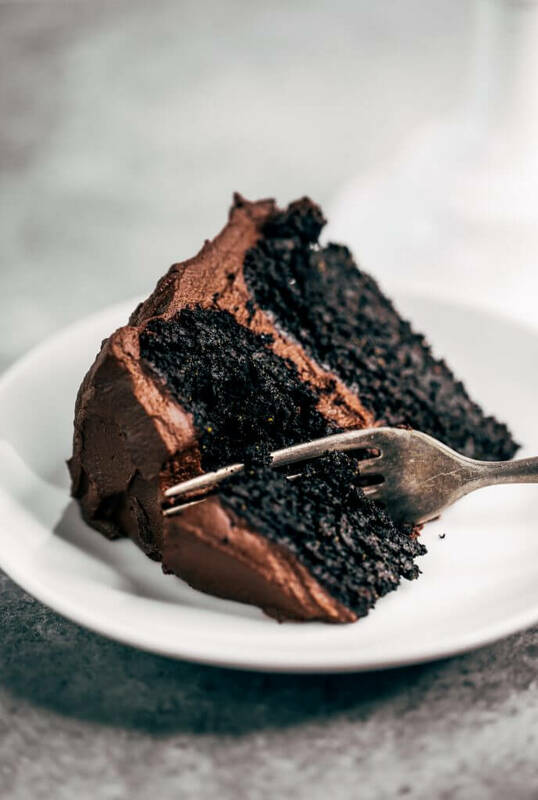 If you’re looking for the perfect birthday cake, celebration cake, or anything cake (you know, like: YOU JUST WANT TO EAT CHOCOLATE CAKE OCCASION CAKE) then this is the recipe you need in your life! You can make this recipe up and freeze the leftovers. I like to individually wrap each of my slices, so when I’m craving cake- I’m all set to pound down a slice. Or you can store a slice in these reusable stasher bags for on-the-go! This looks great. Any recommendation if I only have a 9″ springform or 8″ regular cake pans? Thank you Michael, I would do a one layer 9″ cake if that’s the case. I haven’t tried it to say how it will work, but that’s what I would try. Is it 2 cups of minced, raw sweet potato or 2 cups of sweet potato that we then mince? Just making sure! I used a 9” springform in a convection toaster oven and it took 40 min to bake. Also used butternut squash for icing instead of sweet potato and added 1/8 cup honey to sweeten and some extra cacao. Used sweet potato for the batter and didn’t end up with as dark of a cake as the photos but still really good! I’m allergic to coconut, is there a substitute I can use for the ingredients that call for coconut (coconut sugar/oil/flour) ? Any suggestions for an egg replacement? I’m on AIP… could I also sub cocoa powder for carob powder?? Looks SO YUM!!! I’m desperately craving some chocolate and this would be a slice of heaven right now! Hi Melissa, I haven’t tried this recipe without eggs, but that would be totally cool if it worked! Carob powder should work- the flavor will be different though… I don’t ever cook with carob, so I can’t say for sure how it would turn out. I substituted 1/4 cup mashed ripe banana per egg you would use and the cake turned out AMAZING ! This sounds amazing, but I can’t have eggs. Usually coconut flour calls for lots of eggs but as there is only 2, do you think chia seeds would work? I’ve used chia seeds as egg replacement in cakes before and it works well but not sure with coconut flour. Any advice? Hi Lorna, I’m not sure how this cake would work egg-free, but feel free to give it a go with chia or flax eggs and let me know how it goes. How many servings are in a cake? Looks wonderful! I’m going to try it this weekend ! Hi this looks amazing ! Can I leave the maple syrup out? And can I use xylitol instead of coconut sugar? Thank you! Hi Venna, you can sub the maple syrup for honey, but leaving it out will change the recipe too much. You can however, sub coconut sugar with xylitol. Hi Charlie, I steam the sweet potato in a saucepan with about an inch of water and covered with a lid. I’d like to make this using no processed sugar at all. Would it be ok with just the maple syrup? Hi Sara, I think this recipe would end up being too moist with just maple syrup, but you could try? I’m gonna try this as cupcakes. Can’t wait to trick the kiddos. They think they hate sweet potatoes. Does this recipe rise a lot? How much should I fill a cupcake cup? Hi Mia, I honestly can’t remember how much they rise- it’s been awhile since I made this recipe. Sorry! One of the best Cake recipes ai have found, perfect for anyyone and everyone….except vegetarians, but who doesnt love meat, thank you so much for this recipe, really one of a kind. This looks freaking devine- and a perfect for to bring to Easter dinner! For mixing the frosting, do you use a food processor? Blender? Either? Thanks! Hi Jill, I use a food processor, it’s so easy and whips it up perfect! The cake was great. It tasted like any other, less healthy cake. The frosting just tastes like sweet potato. I added 1/4 cup coconut sugar to sweeten. I would love to make the cake without the dates in the frosting, do you think it would work with coconut nectar or maple syrup instead? Oh my goodness!! It was the best cake ever… truly. I tricked 4 children and 2 picky men (my husband and brother in law) with this recipe. I felt so good giving the children seconds and felt even better about them dipping their fingers into the frosting. Thank you!! I added a little maple syrup to the frosting but otherwise it was PERFECT! That is so awesome, thank you Fawn!! I saw this recipe today and made it tonight. I was impressed. Texture, depth of flavor, and the guilt free decadence were all spot on. Didn’t even feel guilty eating a few spoonfuls of frosting out of the bowl. I do have to say that traditional baking powder (like the one linked to your recipe) is not paleo because of the cornstarch. However, it was easy enough to find a paleo version recipe online so I used that in the cake and had no problems with it rising. Well done on this recipe, I will make it again! Thinking of making this for my son’s 4th birthday on sunday and i dont have black cocoa powder. can i use regular? And for the frosting, is the avocado measured as chopped or mashed? Looks divine and right up our alley food wise! Cant wait to try! Hi Jess, you can use regular cocoa powder and the avocado measured is mashed. 🙂 Enjoy! “1 1/2 cup mashed sweet potato see notes on how to make” – I cant seem to find your notes, I just want to make sure I don’t mess anything up. is there anything special I have to do to the sweet potato besides mashing it? Thanks!! tried your paelo ch0colate cupcakes and they were amazing!! I put peanut butter onto of one instead of the frosting and it was soo delicious also! Hi Dani, nothing special- it’s just steamed sweet potato, mashed, then measured out to 1/2 cup. Enjoy! Recipe. 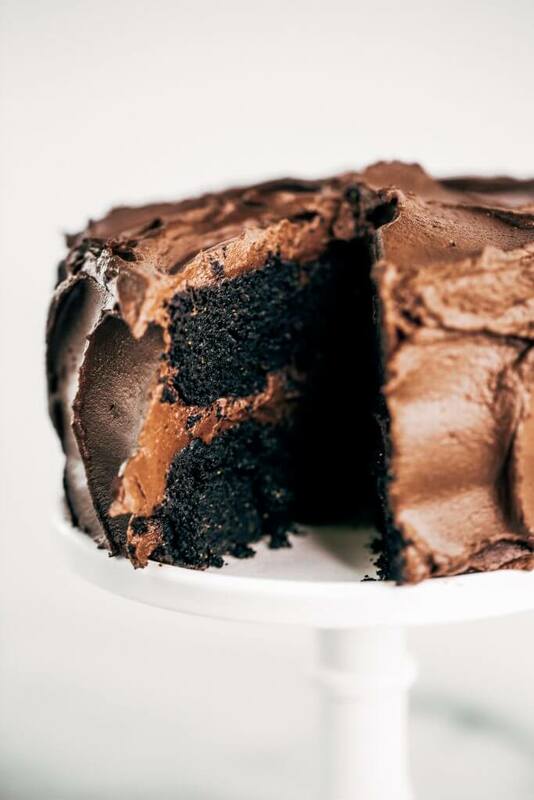 Moist and chocolaty delicious and a bonus that you can freeze leftovers. BAZAAR…just saying 😊 I made the cake and made my own frosting recipe. Really good Paleo cake recipe! Will use again. I just made this and am waiting for it to cool so I can frost it. It looks amazing! What’s the best way to store leftovers? Should they always be kept in the freezer? Thanks! To stay paleo…Just make your own baking powder with arrowroot flour. The recipe is on the back of the arrow root powder package. I am allergic to coconut, so I’m trying a little bean flour in the mix and a little xanthium gum, which makes it not paleo, but I’m doing the recipe for allergies. 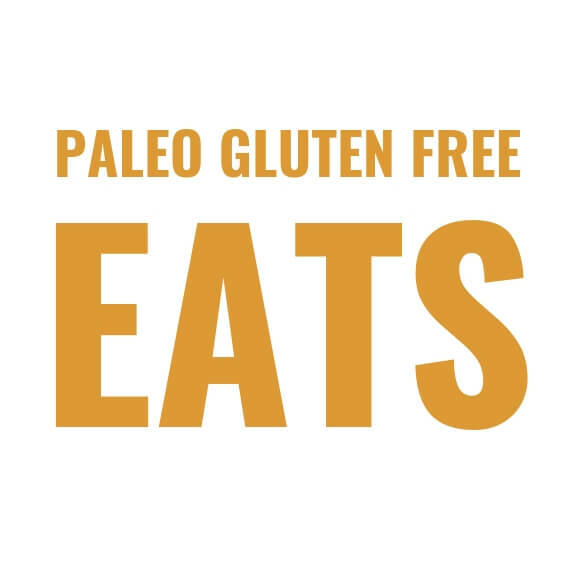 The almost paleo is a bonus! Thanks for all the recipes! Hi! Would this work if I used canned sweet potatoe that’s already mashed? Thanks! Hi Abigail, it might work, but I’m not sure on the flavor- I have never used canned sweet potato before, i’m sure there is a difference. Hi, just wondering if this would work with cooked (+ blended) sweet potatoes? Just that I don’t think my food processor would be able to mince raw sweet potatoes (not tough enough). Thanks! Hi Rebeka, that won’t work the same unfortunately. I really want to make this cake. it look absolutely delicious. Just a few questions. can I use egg white only if so how many would I need? can I substitute spelt flour for the coconut flour, date paste instead of sugar and olive oil for the coconut oil. My kids have food allergies. Hi Norma, I don’t think you would get the same results with those subs… it really won’t be the same cake, but it might suffice if that’s all your kids can eat. The olive oil should work, but the rest of the swaps will really change it, I’m thinking. If I don’t have a food processor, what can I do? Hi Maggie, I don’t really know of a way that would turn out the same results without a food processor unfortunately. This is the best tasting and most guilt free frosting I have ever had. Thank you so much for sharing! I love your website. You say to measure out the sweet potato after you put it in the food processor to mince, but how much should you have when it’s measured out? Also, how much avocado should we have, when measured. Thanks. How can I get the measurements? what is a cup for you? Hi Lucie, the recipe box can convert the measurements to what you might use- see under the serving there is a measurement converter. 🙂 Hope that helps! Can I use regular sugar instead of coconut sugar? This looks incredible. Does it freeze well, and if so, should I frost it before or after freezing? Hi Sam, that might work. Let me know if it works out!